These excellent audiobooks are available from Audible.com. 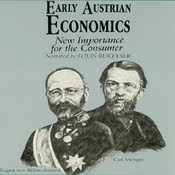 The first one, Early Austrian Economics, features Carl Menger (1840-1921) and Eugen von Bohm-Bawerk (1851-1914) rejecting the classical and Marxian ideas that value can be measured objectively rather than subjectively. 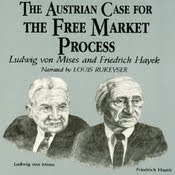 The second audiobook, The Austrian Case for the Free Market Process, features Ludwig von Mises (1881-1973) and Friedrich Hayek (1899-1992) who were perhaps the foremost defenders of the free market and limited government during the mid-twentieth century ascendancy of Keynesian economics. 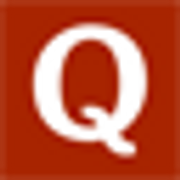 The Economist magazine published a book review of Liaquat Ahamed's Lords of Finance: The Bankers Who Broke the World (2009). Theorizing aside, Ahamed provides a colorful historical account of the tumultuous period of the 1920s and early 1930s, and it seems like a redux of Barry Eichengreen and Peter Temin's "The Gold Standard and the Great Depression" (1997). However, I would disagree that the discipline of a monetary gold standard acts as a negative straightjacket paralyzing government policymakers. The last eight decades have clearly shown the perils and instability of an unparalyzed fiat monetary policy. It is naive to claim that a restrictive gold standard is what caused and exacerbated the Great Depression, because the gold standard of the time was mismanaged by the authorities who increased interest rates to protect reserves, thereby leading to unnecessary levels of contraction and deflation across countries. An Austrian analysis of the period's economic events is available in Murray Rothbard's America's Great Depression as well as Banking and the Business Cycle by C.A. Phillips, T.F. McManus, and R.W. Nelson. More important than adherence to a commodity monetary standard or not, and why this book is relevant to readers of The Monetary Future, is why central bankers possess the anointed capability to make those overriding decisions in the first place. It has become something usual for Ecommerce Journal edition to conduct journalistic investigation sending its reporters to the offices of different payment systems across the world. So far we have made certain that the Internet users are misled by such payment services as Liberty Reserve, Alter Gold, Numox, EcuMoney and others. This time we decided to check up whether the information about the office of Perfect Money Finance Corp. which is acting at the payment systems market as Perfect Money is authentic. According to the allegations of the payment system Perfect Money its brick-and-mortar office locates in Panama. Full address as well as glossy photographs of its headquarters the company demonstrates in the special section on its website. Having just these photos and address information was not enough for us to be sure in reliability of these data. Thus we decided to make a visit to Perfect Money. First, we sent a letter of inquiry to the Support Service asking it to arrange for us a meeting at the office of the company. To our surprise we have received a confirmation. A reporter of the Ecommerce Journal landed in Panama, the capital of the Republic of Panama, early in the morning and immediately headed for the place specified in the business address: Oficina 207, 2-do piso, Century Tower, Tumba Muerto, Panama, Republica Panama. He reports: “Before my departure to Panama I consulted Google Maps service to get some idea of the appearance of the office where Perfect Money is supposed to be. After I started from the Panama airport towards the downtown I noticed the eminent building of Century Tower from afar. “At the reception I was asked where I was going. When I said it was Perfect Money I was looking for they told me the number of the company office. The number turned to be the same as indicated in the address section on the company website. It was 207. “I rang the bell and a nice girl opened the door. After greetings she invited me to the conference hall. Passing one room I cast a look through a chink and noticed that there were some people working at their desktops. I thought they were programmers or Support Team. Later I decided to verify if I was right and I was told that it was a finance department of the company. “During our conversation the secretary told me about the future plans of the company as well as the history of Perfect Money Finance Corp. and she also destroyed some myths about the payment system. Well, the information I got wasn’t new to me, it just clarified my surmises. Of the information they provided I was allowed to publish only some facts. They told me that the company is actively upgrading its Support Team and in a short term they will enable Support Service in other languages with phone support. HARARE -- Zimbabwe's central bank governor Gideon Gono on Thursday proposed the introduction of a gold-backed local currency, which was destroyed by hyperinflation and replaced by multiple foreign currencies in January. 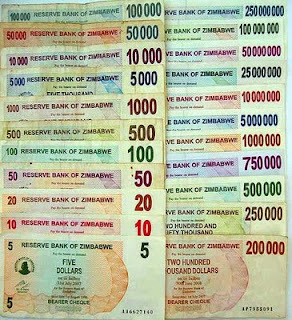 In an article he wrote in the state-controlled Herald newspaper, Gono urged the re-introduction of the Zimbabwe dollar to ease the liquidity crunch, but said this was not a call for "a blind return to the money printing press". 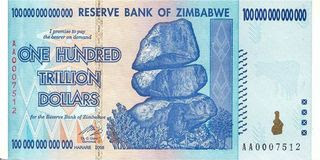 "Rather, what I am calling for is the guarded reintroduction of the Zimbabwe dollar where such a new currency will be fully backed by credible, tangible and locally available assets, such as gold, diamonds or platinum, among several other possibilities," Gono said. Zimbabwe's inflation has tumbled from an official annual rate of 231m % in July 2008 -- which independent analysts say was understated -- to a monthly rate of 1% in July 2009 following the decision to abandon the local currency. But the unity government, which says it needs at least $8.3 billion for reconstruction, has so far failed to attract anticipated foreign financial aid, with Western donors demanding broad economic and political reforms. "Whilst Zimbabwe has managed to stabilise the hyperinflationary pressures that characterised 2008, the country has relapsed into a serious demand deficiency loop that is threatening to choke the productive sectors across the board," Gono said. "As a country we had pinned our hopes on vibrant financial liquidity being injected by outsiders. This has not yet happened. Industrialists too are on the brink of relapsing into the downward spiral due to the severe demand deficiency now dangerously characterising the country's goods and services markets." "Government will establish an independent committee to ascertain and certify the quantity of gold or diamonds produced to back the issuance of local currency," Gono said. Goldgrams® are the basic units of value within the GoldMoney system. One troy ounce of pure gold bullion contains 31.103 grams of metal, and one goldgram (gg) is equal to one gram. It's really not much different than a registered bank account or a gold bullion account in the United States. GoldMoney from Net Transactions Limited is regulated by the Jersey Financial Services Commission under the Financial Services (Jersey) Law of 1998 within the British Channel Islands. Jersey is an autonomous possession of the British Crown, and Britain is responsible for its external affairs including negotiations with the European Union. However, be careful because GoldMoney is not anonymous and it is not untraceable. I realize that this article will tend to get a lot of people worked up, because James Turk and his crew have been dutifully serving the precious metals buying community for many years. It is an exemplary organization with superior customer service, top-grade insurance policies, and routine vault audits; however, it has two other features that do not serve it well as a potential leader in the emerging digital gold currency field. First, GoldMoney follows the same know-your-customer rules with proof of identification that most banks around the world adhere to as part of FATF (Financial Action Task Force) guidelines. That puts GoldMoney at a serious disadvantage. For a digital currency to thrive and survive, it must possess, at a minimum, the same features that make a $100 bill and 500-Euro note so popular -- namely anonymity and untraceability. Otherwise, it is not true electronic cash but merely another traceable book entry that can be subpoenaed by governmental or taxation authorities. Second, the physical and legal jurisdiction that Net Transactions Limited has selected for its base of operations, British Channel Islands, does not permit it to conduct operations in a way that would ever lead to a viable, circulating digital gold currency. Unlike admirable digital currency jurisdictions such as Panama, the British Channel Islands will blindly conform to both OECD and FATF guidelines in an effort to retain so-called legitimacy. GoldMoney has been neutered like e-gold, although sadly, with GoldMoney it was voluntary. "It really is not electronic cash unless your privacy is protected. That's the idea of cash. You don't have to reveal your identity to pay. Cash is the most popular payment system on the planet. It's something even kids know how to use. Its particular structure may have had one technological origin, but its now established as a fundamental payment system and certainly the most prevalent one. If you want to create an electronic thing that will replace cash, at least in cyberspace, then it should have all the features that cash has. It can have more features, but it can't have fewer." In other words, be very afraid of the cashless society unless the privacy of paper cash is vigilantly maintained. What is hawala and how does it work? Hawala operates today as an informal value transfer system outside of the normal, transparent banking apparatus where transactions can be completely anonymous. Its integrity rests on the performance and honor of a huge network of money brokers (hawaladars), which are primarily located in the Middle East, South Asia, and North Africa. An ancient alternative remittance system, hawala has its origins in classical Islamic law dating back to the 8th century, and it was used for trade financing because of the dangers of traveling with gold and other forms of payment on routes beset with bandits. The concept of agency in common law and aval in French civil law were influenced by hawala, and the word aval is even derived from the word hawala. The settlement of the liability position of HA vis-à-vis HB that was created by the initial transaction can be done through imports of goods or "reverse hawala." A reverse hawala transaction is often used for investment purposes or to cover travel, medical, or education expenses from a developing country. In a country subject to foreign exchange and capital controls, a customer (XB) interested in transferring funds abroad for, in this case, university tuition fees, provides local currency to HB and requests that the equivalent amount be made available to the customer's son (XA) in another country (A). Customers are not aware if the transaction they initiate is a hawala or a reverse hawala transaction. HB may use HA directly if funds are needed by XB in country A or indirectly by asking him to use another correspondent in another country, where funds are expected to be delivered. A reverse hawala transaction does not necessarily imply that the settlement transaction has to involve the same hawaladars; it could involve other hawaladars and be tied to a different transaction. Therefore, it can be simple or complex. Furthermore, the settlement can also take place through import transactions. For instance, HA would settle his debt by financing exports to country B, where HB could be the importer or an intermediary. When compared to the traditional banking infrastructure, hawala's attractiveness lies in six primary features: (1) cost effectiveness, (2) efficiency, (3) reliability, (4) lack of bureaucracy, (5) lack of a paper trail, and (6) invisible from scrutiny by the taxation authorities. The hawala system has been immensely beneficial to the unbanked, and afraid, migrant workers sending money home to family members and for businesses transferring trade payments in largely underdeveloped economies lacking efficient banking services. It should not be dismantled to suit out-of-jurisdiction governments. The notion that some elements may utilize hawala for nefarious purposes does not outweigh the societal benefits, and it certainly does not outweigh the core principles of freedom of choice in banking and true financial privacy. In the first category, Best AutoExchanger went to Intexchange and they were interviewed by Ecommerce Journal after receiving the award. In the second category, Best Exchanger went to London Gold Exchange. To initiate any activity on the Loom system, each user must create at least one wallet (also known as a folder) which will hold all of the user’s assets. There are no formal accounts in a Loom system as you may find in conventional online payment systems like PayPal or Moneybookers. Unlike PayPal which restricts all users to just one account, Loom users are permitted to have multiple folders. The Loom folder does not require any identifying information (not even a name) and the only activity required to create a Loom folder is to choose a passphrase. The passphrase is the single identifying item(data) required to open & operate a Loom folder. Don’t lose it and don’t let others get your passphrase. A basic description of the Loom system might involve comparing it to an endless checkerboard or grid. As one user wants to send an asset to another user, a randomly generated location in cyberspace accepts a deposit of that asset. The secret location (number) on the grid which now contains that asset value is then delivered to the recipient. Private delivery of this number can be accomplished by any host of methods including but not limited to email, phone, fax, sms or written on a slip of paper and hand delivered. Once the receiver has the number in his possession, they can simply log in to their private folder and accept the asset (remove it from the identified checkerboard location and place into their folder). This is a rather simplified description of the Loom operation but it is accurate. To sum things up, “an account” at any standard online payments company is comparable “a folder” in the Loom system. A payment is comparable to an asset transfer. Unlike a Moneybookers account where a transaction may be completed by sending money, Loom transactions have two parts. The sender places the asset in a shared location and the receiver then picks up the asset. The transaction is not completed and may be recalled until the receiver picks up the asset. By placing an asset on a private location and sharing that location, the Loom user is creating a “shared asset” which can be accessed by both users and is visible in both folders. What is a Loom asset? An asset is a type of digital value that can be created by a Loom user and moved around between contacts in the Loom system. Assets under the full ownership of the issuer which have not been already transferred to another user destroyed(removed from the system) by that issuers. An digital asset may represent something of value in the real world. However, the Loom asset is just the digital representation of ownership. In effect users are moving the digital “right of title” of a physical asset. If the issuer of a Loom The representation, worth and value of a digital Loom asset are determined by the individual who created it, known as the issuer. Any user can issue new assets at anytime, these new assets may be identified in any way the issuer permits. However, most new users find it more common to accept assets already issued by another trusted parties. A new user may have been invited to create a folder and use the Loom system by accepting some existing assets given to him by an existing user. Example: Graham is an existing user who has issued a digital gold gram product. A brand new user may be invited to create a folder and receive 2 grams of digital gold as payment for services rendered. In such a case the new user would not issue his or her own assets but just receive the gold gram payment. Please understand that no physical assets ever change hands. The Loom system offers digital units which represent an item. Those digital units may have a valuable physical asset pledged by the issuer as backing or the digital assets may represent anything else of no real world value, such as a “Thank You”, an “IOU” or just “Hugs and Kisses”. Users may create as many assets as they desire, there is no limit to the variety or amount of assets which can be privately created by any user. (no restrictions) Users also have the option to transact exchanges using existing assets which were issued by another party. As a new user, you are not required to create new assets, you may use already issued assets. When a user creates a new asset, that user is the sole issuer and pays that new asset into existence. Once created, a new asset will appear as a negative balance on the creator’s home page. The negative reference indicates that the asset is a liability to that user who created it. Viewing a brand new asset, the ledger will show a balance of zero (-0, negative zero) because at that time no units of that asset have been spent into existence. Once transfers of the asset begin to take place the balance for that asset will drop further and further into the negative value depending on how much is being used at any time. The magnitude of the negative balance will, at all times, be equal the total quantity of the asset held by all other users in the system. This total figure is equal to all currently issued digital units of that asset. Example: If 100 users each have 1 unit, the issuer’s balance will show -100. Adding asset details to your folder is required before anyone can transact in a particular asset. In order to effect a transfer between users, the receiver must be given specific details about the units and then add those details to their folder. Once the asset parameters exist in the user’s account, transfers of that asset can occur between folders. Assets have several parameters which must be ’set’ upon the creation of that asset and also anytime another user adds the ability to accept that asset into their folder. These 4 parameters are shown here. 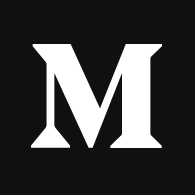 The “ID” is a number which uniquely identifies the asset. It must be a “hexadecimal” number, consisting of exactly 32 digits 0-9 or a-f. Note that when creating a new asset, the software will automatically insert a brand new random ID on your behalf, which can be used with confidence or if preferred any other hex number may be substituted at the time of creation, if so desired. The “Name” is used to identify the asset and can be anything the user prefers. If the original issuer called his assets apples, another user may want to exactly copy this term or use another. Any user may label that asset anything they desire. It does not have to be unique across the entire Loom system. (As a user, you may want to label the asset “green apples” or “purple oranges”, this is your choice.) This label is only visible from the user’s own folder. The ID is the specific label which truly distinguishes the asset. The Scale is a number which tells the system where to put the decimal point. For example, if you have 123456789 units of the asset type and the Scale is set to 7, the number will be displayed as 12.3456789 in your folder. If you omit the Scale, it’s the same as 0. The Min Precision is optional. This forces the system to display at least a certain number of decimal places. For example, if you set Min Precision to 3, then the number “12.1″ will be displayed as “12.100″. Fortunately the software developer has automated much of this work. To add an asset to your folder, a user is only required to enter the ID, the rest is set automatically. Activity between users falls into three categories: person2person, person2business and business2business. (Loom makes no distinction between “person” and “business”) The digital units which exist on a Loom system are distinctly private and their existence is only known to the user which created the unit. (issuer) There is no public disclosure (menu, index or list) of digital units which exist on the Loom software. As a user, if you create an asset for the movement of value between specific friends or business associates, that asset if only known to you and to others whom you disclose its existence. (There is no dropdown menu or list of assets where a random user may select to use your private asset, this information is absolutely private to the issuer.) The actual knowledge an issuers name, who uses that asset and what that asset is used for….is 100% private. Even the operator of the system, the person who installed the software and operates the server, does not have the ability to discover which assets have been created or are operating on the system. Some Loom users will keep their assets private and only provide that information to known friends or associates. Other users will publicly list their units with the intent of attracting more customers and business. The bottom line: If others learn of your asset it is because you wanted to share that information. As a user, if you are not aware of an asset or have not added the asset’s details to your folder, it is technically impossible to effect a transfer of that asset. Example: If I tell you, I would like to transfer you ownership of 100 “Guru Gold” grams, before you can accept these assets, you must have already received the precise ID, Scale and Min Precision. Once a user has set up their folder to send or receive this asset, movement of units in or out of the account can begin. Since this process is now automated the only item needed to add the asset profile to your folder is the ID. These may be two assets which trade between Loom users and each digital unit is a title representing something to that user. However, these digital units may or may not represent any real value. It should be easy to double-click, copy, and paste that description into an email or chat. You can also publish it on a blog or web site (along with some explanatory text) so others can see it and investigate it for themselves. When the receiver gets this ID, he can easily accept it into his folder. After that time the two users can create a shared point and exchange this asset. These links also include a “Tutorial” which gives you the chance to try out the API interactively. The Loom Content Management System [https://loom.cc/?function=edit] is a very basic system for managing documents in the Loom Archive. You can create, delete, edit, and upload data here, paying in usage tokens. There is also some Tools [https://loom.cc/?function=folder_tools] which do some computations with IDs and passphrases. Ask a friend who already uses the system. Search on the term “loom invitation” or “usage tokens” using a prominent search engine. Read blogs, post queries on email lists, etc. Mykolas Romeris University (Vilnius, Lithuania) published "Alternative Payment Systems: Lithuanian Outlook" by Darius Štitilis and Marius Laurinaitis in its 2008 Number 2(4) edition of Intellectual Economics. Darius is on the Faculty of Economics and Finance Management, Department of Informatics and Statistics as Associate Professor. He is also the author of more than 20 scientific articles and four manual books. Marius is on the Faculty of Economics and Finance Management, Department of Banking and Investments as Lector. The article elaborates on an electronic payment instrument of a new generation – electronic money and preconditions for using this instrument in Lithuania. It discusses the definition of electronic money, analyses requirements defined for electronic money, as well as needs of buyers in the framework of electronic commerce (security, low cost, universal nature, etc.). "Electronic money must be perceived as appropriate payment instruments which are purchased by the user at an electronic value from a person who provides an electronic money issuing service. The aforementioned electronic value must be equated to cash. Also, absence of linking to a bank account and acceptance by natural and legal persons other than the issuer are very important features of electronic money." Additionally, it cites extensively the 1995 digital cash work of fellow Lithuanian, Jon W. Matonis. Almost everyone is aware that federal government spending in the United States is scheduled to skyrocket, primarily because of Social Security, Medicare, and Medicaid. Recent "stimulus" packages have accelerated the process. Only the naively optimistic actually believe that politicians will fully resolve this looming fiscal crisis with some judicious combination of tax hikes and program cuts. Many predict that, instead, the government will inflate its way out of this future bind, using Federal Reserve monetary expansion to fill the shortfall between outlays and receipts. But I believe, in contrast, that it is far more likely that the United States will be driven to an outright default on Treasury securities, openly reneging on the interest due on its formal debt and probably repudiating part of the principal. To understand why, we must look at U.S. fiscal history. Economists refer to the revenue that government or its central bank generates through monetary expansion as seigniorage. Outside of America's two hyperinflations (during the Revolution and under the Confederacy during the Civil War), seigniorage in this country peaked during World War II, when it covered nearly a quarter of the war's cost and amounted to about 12 percent of Gross Domestic Product (GDP). By the Great Inflation of the 1970s, seigniorage was below two percent of federal expenditures or less than half a percent of GDP.1 This was partly a result of globalization, in which international competition disciplines central banks. And it also was the result of sophisticated financial systems, with fractional reserve banking, in which most of the money that people actually hold is created privately, by banks and other financial institutions, rather than by government. Consider how little of your own cash balances are in the form of government-issued Federal Reserve notes and Treasury coin, rather than in the form of privately created bank deposits and money market funds. Privately created money, even when its quantity expands, provides no income to government. Consequently, seigniorage has become a trivial source of revenue, not just in the United States, but also throughout the developed world. Only in poor countries, such as Zimbabwe, with their primitive financial sectors, does inflation remain lucrative for governments. The current financial crisis, moreover, has reinforced the trend toward lower seigniorage. Buried within the October 3, 2008 bailout bill, which set up the Troubled Asset Relief Program (TARP), was a provision permitting the Fed to pay interest on bank reserves, something other major central banks were doing already. Within days, the Fed implemented this new power, essentially converting bank reserves into more government debt. Fiat money traditionally pays no interest and, therefore, allows the government to purchase real resources without incurring any future tax liability. Federal Reserve notes will, of course, continue to earn no interest. But now, any seigniorage that government gains from creating bank reserves will completely vanish or be greatly reduced, depending entirely on the differential between market interest rates on the remaining government debt and the interest rate on reserves. The lower is this differential, the less will be the seigniorage. Indeed, this new constraint on seigniorage becomes tighter as people replace the use of currency with bank debit cards and other forms of electronic fund transfers. In light of all these factors, even inflation well into the double digits can do little to alleviate the U.S. government's potential bankruptcy. We all know that there is a limit to how much debt an individual or institution can pile on if future income is rigidly fixed. We have seen why federal tax revenues are probably capped between 20 and 25 percent of GDP; reliance on seigniorage is no longer a viable option; and public-choice dynamics tell us that politicians have almost no incentive to rein in Social Security, Medicare, and Medicaid. The prospects are, therefore, sobering. Although many governments around the world have experienced sovereign defaults, U.S. Treasury securities have long been considered risk-free. That may be changing already. Prominent economists have starting considering a possible Treasury default, while the business-news media and investment rating agencies have begun openly discussing a potential risk premium on the interest rate that the U.S. government pays. The CBO estimates that the total U.S. national debt will approach 100 percent of GDP within ten years, and when Japan's national debt exceeded that level, the ratings of its government securities were downgraded. The much (unfairly) maligned credit default swaps (CDS) in February 2009 were charging more for insurance against a default on U.S. Treasuries than for insurance against default of such major U.S. corporations as Pepsico, IBM, and McDonald's. Because the premiums and payoffs of the CDS on U.S. Treasury securities are denominated in Euros, the annual premiums also reflect exchange-rate risk, which is probably why, with the subsequent modest decline in the dollar, CDS premiums for ten-year Treasuries fell from 100 basis points to almost 30.4 But you can make a plausible case that CDS underestimate the probability of a Treasury default since such a default could easily have far reaching financial repercussions, even hurting the counterparties providing the insurance and impinging on their ability to make good on their CDS. Surely the purchasers of the U.S. Treasury CDS have not overlooked this risk, which would be reflected in a lower annual premium for less-valuable insurance. Predicting an ultimate Treasury default is somewhat empty unless I can also say something about its timing. The financial structure of the U.S. government currently has two nominal firewalls. The first, between Treasury debt and unfunded liabilities, is provided by the trust funds of Social Security, Medicare, and other, smaller federal insurance programs. These give investors the illusion that the shaky fiscal status of social insurance has no direct effect on the government's formal debt. But according to the latest intermediate projections of the trustees, the Hospital Insurance (HI-Medicare Part A) trust fund will be out of money in 2017, whereas the Social Security (OASDI) trust funds will be empty by 2037.5 Although other parts of Medicare are already funded from general revenues, when HI and OASDI need to dip into general revenues, the first firewall is gone. If investors respond by requiring a risk premium on Treasuries, the unwinding could move very fast, much like the sudden collapse of the Soviet Union. Politicians will be unable to react. Obviously, this scenario is pure speculation, but I believe it offers some insight into the potential time frame. The second financial firewall is between U.S. currency and government debt. 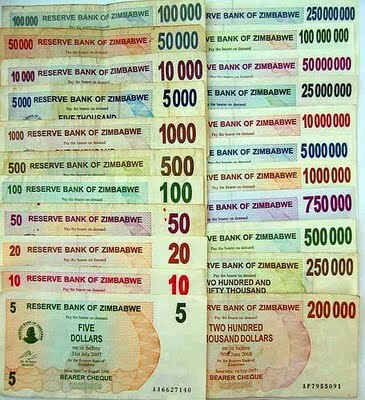 It is not literally impossible that the Federal Reserve could unleash the Zimbabwe option and repudiate the national debt indirectly through hyperinflation, rather than have the Treasury repudiate it directly. But my guess is that, faced with the alternatives of seeing both the dollar and the debt become worthless or defaulting on the debt while saving the dollar, the U.S. government will choose the latter. Treasury securities are second-order claims to central-bank-issued dollars. Although both may be ultimately backed by the power of taxation, that in no way prevents government from discriminating between the priority of the claims. After the American Revolution, the United States repudiated its paper money and yet successfully honored its debt (in gold). It is true that fiat money, as opposed to a gold standard, makes it harder to separate the fate of a government's money from that of its debt. But Russia in 1998 is just one recent example of a government choosing partial debt repudiation over a complete collapse of its fiat currency. Admittedly, seigniorage is not the only way governments have benefited from inflation. Inflation also erodes the real value of government debt, and if the inflation is not fully anticipated, the interest the government pays will not fully compensate for the erosion. This happened during the Great Inflation of the 1970s, when investors in long-term Treasury securities earned negative real rates of return, generating for the government maybe one percent of GDP, or about twice as much implicit revenue as came from seigniorage. But today's investors are far savvier and less likely to get caught off guard by anything less than hyperinflation. To be clear, I am not denying that a Treasury default might be accompanied by some inflation. Inflationary expectations, along with the fact that part of the monetary base is now de facto government debt, can link the fates of government debt and government money. This is all the more reason for the United States to try to break the link and maintain the second financial firewall. We still may end up with the worst of both worlds: outright Treasury default coupled with serious inflation. I am simply denying that such inflation will forestall default. Still unconvinced that the Treasury will default? The Zimbabwe option illustrates that other potential outcomes, however unlikely, are equally unprecedented and dramatic. We cannot utterly rule out, for instance, the possibility that the U.S. Congress might repudiate a major portion of promised benefits rather than its debt. If it simply abolished Medicare outright, the unfunded liability of Social Security would become tractable. Indeed, one of the current arguments for the adoption of nationalized health care is that it can reduce Medicare costs. But this argument is based on looking at other welfare States such as Great Britain, where government-provided health care was rationed from the outset rather than subsidized with Medicare. Rationing can indeed drive down health-care costs, but after more than forty years of subsidized health care in the United States, how likely is it that the public will put up with severe rationing or that the politicians will attempt to impose it? And don't kid yourself; the rationing will have to be quite severe to stave off a future fiscal crisis. Other welfare States have higher taxes as a proportion of GDP, with Sweden and Denmark in the lead at nearly 50 percent.6 Can I really be confident that the United States will never follow their example? Let us ignore all the cultural, political, and economic differences between small, ethnically-unified European States and the United States. We still must factor in the take of state and local governments, which, together with the federal government, raises the current tax bite in the United States to 28 percent of GDP, only five percentage points below that of Canada. Recall that the CBO projects that federal spending alone for 2082 will reach almost 35 percent of GDP, excluding rising interest on the national debt. Thus, if taxes were to rise pari passu with spending, the United States might be able to forestall bankruptcy with a total tax burden, counting federal, state, and local, of around 45 percent of GDP—15 percentage points higher than the combined total at its World War II peak, higher than in the United Kingdom and Germany today, and nearly dead even with Norway and France. However, if there is any significant lag between expenditure and tax increases, the increased debt would cause the proportion to rise even more. Furthermore, this estimate relies on the CBO's economic and demographic assumptions about the future, along with the assumption of absolutely no increase in state and local taxation as a percent of GDP. More-pessimistic assumptions also drive the percentage up. Even conceding that federal taxes might rise rapidly enough to a level noticeably higher than during World War II overlooks an important consideration: All the social democracies are facing similar fiscal dilemmas at almost the same time. Pay-as-you go social insurance is just not sustainable over the long run, despite the higher tax rates in other welfare States. Even though the United States initiated social insurance later than most of these other welfare States, it has caught up with them because of the Medicare subsidy. In other words, the social-democratic welfare State will come to end, just as the socialist State came to an end. Socialism was doomed by the calculation problem identified by Ludwig Mises and Friedrich Hayek. Mises also argued that the mixed economy was unstable and that the dynamics of intervention would inevitably drive it towards socialism or laissez faire. But in this case, he was mistaken; a century of experience has taught us that the client-oriented, power-broker State is the gravity well toward which public choice drives both command and market economies. What will ultimately kill the welfare State is that its centerpiece, government-provided social insurance, is simultaneously above reproach and beyond salvation. Fully-funded systems could have survived, but politicians had little incentive to enact them, and much less incentive to impose the huge costs of converting from pay-as-you-go. Whether this inevitable collapse of social democracies will ultimately be a good or bad thing depends on what replaces them. 1. Gary M. Walton and Hugh Rockoff, History of the American Economy, 10th ed. (Mason, OH: South-Western, 2005), p. 500; Robert Higgs, "The World Wars," in Price Fishback, et. al., History of the American Government and Economy: Essays in Honor of Robert Higgs (Chicago: University of Chicago Press, 2007); Jeffrey Rogers Hummel, "Death and Taxes, Including Inflation: The Public versus Economists," Econ Journal Watch, 4 (January 2007): 46-59. 2. 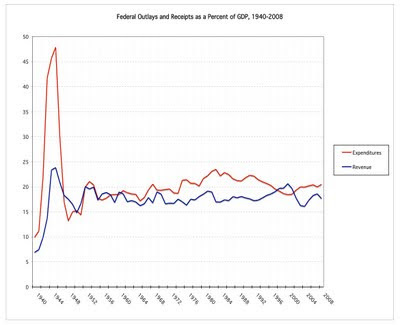 Data on government expenditures and revenues come from Susan B. Carter, et. al., eds., Historical Statistics of the United States: Earliest Times to the Present, Millennial ed. (New York: Cambridge University Press, 2006), v. 5, Series Ea584-678, as brought forward by Budget of the United States Government: Historical Tables Fiscal Year 2010 (Washington: U.S. Government Printing Office, 2009). Annual estimates for GDP are from Louis D. Johnston and Samuel H. Williamson, "What Was the U.S. GDP Then?" MeasuringWorth, 2008. Their GDP numbers coincide with those of the U.S. Bureau of Economic Analysis. 3. Office of Management and Budget, A New Era of Responsbility: Renewing America's Promise (Washington: U.S. Government Printing Office, February 2009), Table S-1, p. 114; Doug Elmendorf, Federal Budget Challenges (Washington: Congressional Budget Office, April 2009), pp. 3-11. 4. A basis point is one hundredth of a percentage point. 5. Social Security and Medicare Boards of Trustees, Status of the Social Security and Medicare Programs: A Summary of the 2009 Annual Reports. 6. Organisation for Economic Co-operation and Development, Revenue Statistics 1965-2007, 2008 Edition, Table A (Paris: OECD, October 15, 2008). PDF file. Jeffrey Rogers Hummel is Associate Professor of economics at San Jose State University. It is with a very heavy heart that I regret to inform you that I have suspended (closed) the Liberty Dollar operation until I am acquitted. After 23 years of research and development plus almost 11 years of practical application in the marketplace, I did not make this decision easily. When I discovered that the FBI had issued an arrest warrant for me, I turned myself in to the U.S. marshals on June 4. After I was booked and made a very quick court appearance in Fort Myers, Florida, I was released on an appearance bond with certain terms, such as: Don't violate any laws, call every Tuesday, fax a report every month, etc. But when I made my initial appearance in U.S. District Court in Charlotte on July 6, I was ambushed by the Justice Department prosecutor with FBI Agent Romaguolo grinning by his side. 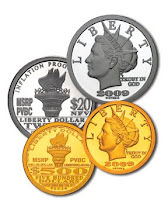 "(Restricted) Setting conditions of release with additional condition: Defendants shall not circulate or aid in the circulation of any coins or currency in relation to the Liberty Dollar operation -- by Magistrate Judge David S. Cayer on 7/6/09." Please note this is not exactly what the judge said in court. This is the written record. So upon leaving the courtroom I thought the Liberty Dollar was still secure even though the judge's wording was vague. But it should not be any surprise to you that vagueness could be deliberately used against me. Plus I initially thought that if I was incarcerated, I could bail out, but that turned out to be impossible. While the Eighth Amendment states, "Excessive bail shall not be required," it does not specify that bail must be set. So Congress passed a law that permits the federal courts to set no bail. The U.S. Supreme Court has upheld that law. The simple truth is that federal courts in North Carolina do not set any bail. If you are arrested for a federal offense in North Carolina you are either out on an appearance bond or you sit in jail until your trial, which is usually more than a year for serious offenses such as counterfeiting and murder. Given such a stern choice, I chose the appearance bond with all its encumbering terms and am forced to close the Liberty Dollar until I am acquitted. I trust you can commiserate with my decision. My most heartfelt thanks for your support of the Liberty Dollar at its hour of need and in face of such uncertainty. You have been wonderful and I am deeply grateful for your support. With your continued help we can win this case. I am represented by Deke Falls. Kevin Innes is represented by Claire J. Rauscher. Sarah Bledsoe is represented by Joe von Kallist. Rachelle Moseley is represented by Matthew Pruden. As for pending Liberty Dollar orders, I regret that they are delayed. We are pursuing legal action so we can fill all orders placed before the judge issued the oral order. I will contact you if you placed an order after the oral order of July 6. Your continued patience will be greatly appreciated as we give this our best shot. If you paid with a credit or debit card, please do not charge back or cancel your order with your card company, as this will have a disastrous effect on the Liberty Dollar. If you must cancel your order, please email me editor@libertydollar.org and I will contact you personally. We are working on this matter and will resolve it as soon as possible. I will also send an email to you as soon as I know when you can expect your order. Please donate something. If you think that the Liberty Dollar case is vitally important to the future of free-market money that is value-based, especially honest money of just weights and measures, then I invite and encourage you to take action. No, you don't have to "get involved." All you need to do is send something. Money in any form is good and anything we can sell on eBay is OK too. While the government has to pay for our defense, we still have to cover transportation and expenses for meetings with our attorneys and the trial. If you prefer value-based, private money that appreciates against depreciating fiat government money, please do something to support the Liberty Dollar. Come to the trial. Got a dog in this fight? My apologies if you are holding some of the warehouse receipts, had your property confiscated, or have not received your order. I encourage you to plan now to come to the trial. It most likely will be held in the first part of 2010. As the government has been working on its case for two years, we need time to organize our case and schedule witnesses, etc. Plan now for a trial in January at the earliest and I will keep you informed via the monthly Liberty Dollar News as we count down to liberating the Liberty Dollar and returning your property. Bernard von NotHaus is founder and monetary architect of the Liberty Dollar.